Salsify originated in the Mediterranean with the ancient Romans and Greeks. It was used throughout the region as a medicine and had ornamental value. In the middle ages, Salsify was considered a powerful tonic. It was also used in Spain to treat snake bites. It was a popular root crop in America in the 1700’s. 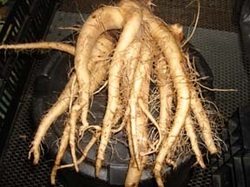 Thomas Jefferson grew Salsify in his Virginia gardens. FLAVOR: A deliciously unique flavor unlike any other vegetable. NUTRITION: A good source of Calcium, Iron, and Phosphorus. COOKING: Scrub roots, cook unpeeled (skin contributes to flavor and vitamins); rub the skin off and enjoy. GROWN: West Star Farm Salsify is grown in all natural conditions. No synthetic fertilizers, pesticides, herbicides, artificial waxes or coloring are applied. Cover Salsify in cold water. Add vinegar and salt. Bring to boil and cook (covered) for 15-20 minutes or until tender enough to mash. Drain thoroughly. Mash salsify, adding pepper, 1 tablespoon butter, 1 egg, and garlic powder. Form into flat patties 1-3 inches in diameter. Dredge lightly with flour. Cook in remaining butter. Makes 12-24 patties or 6 servings. Wash salsify well and leave to soak for 1 hour in cold water (which makes peeling easier). Scrape or peel with a vegetable peeler. As salsify is prepared, put it into water with a little lemon juice. If used raw, sliver salsify and garnish over salad. If cooked, cook in boiling vegetable stock covered and simmer for 1-1 1/2 hours. Then drain and pat dry. Slice and add to salad. Wash salsify well and soak n cold water for 1 hour. Peel with vegetable peeler. Slice into 1/4 inch thick pieces. Heat milk to maximum temperature of 130 degrees. Melt butter in sauce pan and add garlic powder, celery salt, parsley flakes, worchester sauce, and tabasco. After ingredients are thoroughly blended with melted butter, add salsify and oysters (optional). Cook gently until salsify is soft then add to milk. Season with salt and pepper. Make acidulated water by squeezing juice of lemon into 2 quarts of cold water. Peel salsify, cut in half, and drop pieces into water. Put flour into large non-reactive sauce pan and stir in enough acidulated water to make a paste, then stir in the rest of water. Add salsify and 1/4 teaspoon of salt to pan. Bring to a boil, stirring occasionally to keep flour from forming lumps. Cook salsify until tender (10-12 minutes), then drain. Melt butter in skillet over high heat. Add salsify and shake pan back and forth over heat to coat salsify with butter (about 1 minute). Season salsify with 1/4 teaspoon salt, pepper, thyme, marjoram, chives and parsley. Cook for 30 seconds. Transfer to a dish and serve immediately. 6 servings.